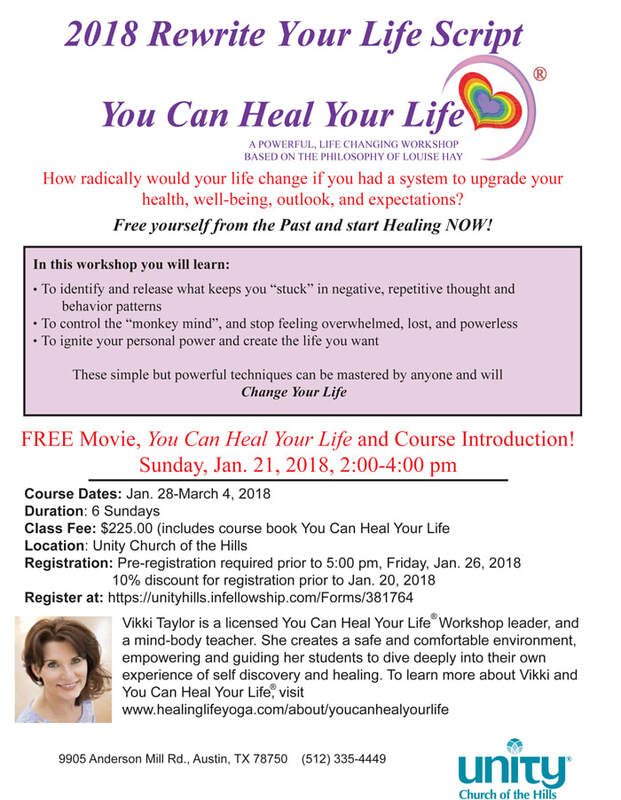 You Can Heal Your Life ®, based on Louise Hay’s book of the same title, is a step-by-step, practical process for identifying and releasing the thoughts, beliefs, and behavior patterns that keep us stuck or undermine our ability to experience inner joy and reach our highest potential. The process teaches us to create peace, harmony and balance in our minds, which naturally extends to the rest of our lives. 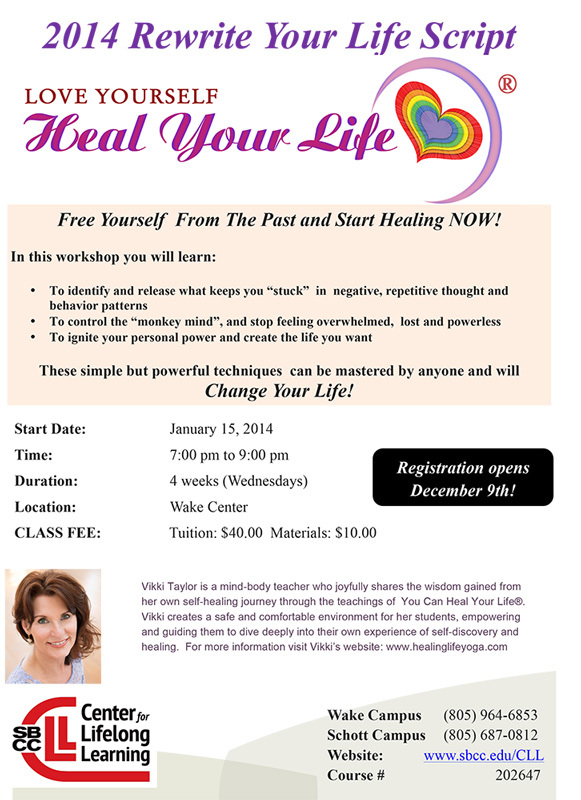 Heal Your Life is one of the most powerful and easiest tools for achieving true healing and personal transformation. Anyone can learn and practice these simple, yet powerful techniques. There is no “magic” or secret process. All that is required is a genuine desire to commit yourself to change and a series of practical exercises to make these changes happen. 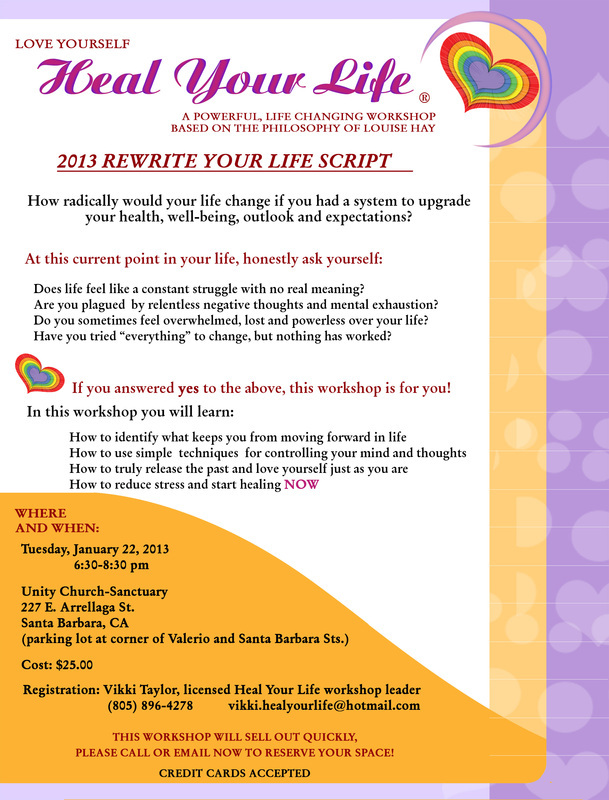 If you have tried “everything” and nothing has worked, this workshop is for you. ​Reduce Stress and start healing NOW! 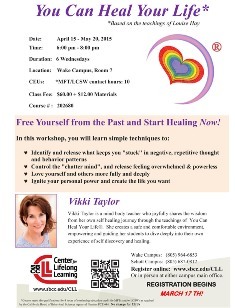 ​​Lastly, you will be gently and skillfully guided through this process toward an experience of your own power, inner wisdom and strengths in a safe and supportive environment by Vikki Taylor, a licensed You Can Heal Your Life ® workshop leader. From a recent participant in my "You Can Heal Your Life" 6 Week Workshop:"
"I wanted to share some more progress I have made after I took your class (You Can Heal Your Life). I couldn't talk about it in class, but I have OCD. OCD thoughts are not true, so the class was a perfect platform to change my irrational thoughts. The Quantum Light Breath is a highly focused breathing meditation process that greatly accelerates the user’s personal transformation by bypassing the conscious mind and releasing old programs directly from the subconscious. Subconscious cleansing opens a powerful portal into our expanded inner awareness, where we experience heightened intuition and guidance to our Highest Self. 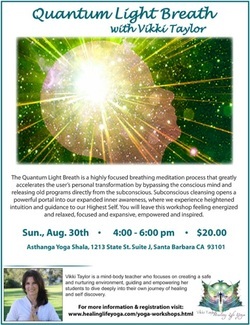 Quantum Light Breath provides an effortless dive into the blissful space that resides beneath thought, freeing us to experience a pure sense of Present Moment and intimacy with the Authentic Self. Because The Quantum Light Breath cleans out impurities and toxins from all the various aspects of your being - physical, mental, emotional and spiritual, some participants experience powerful changes even after one session. 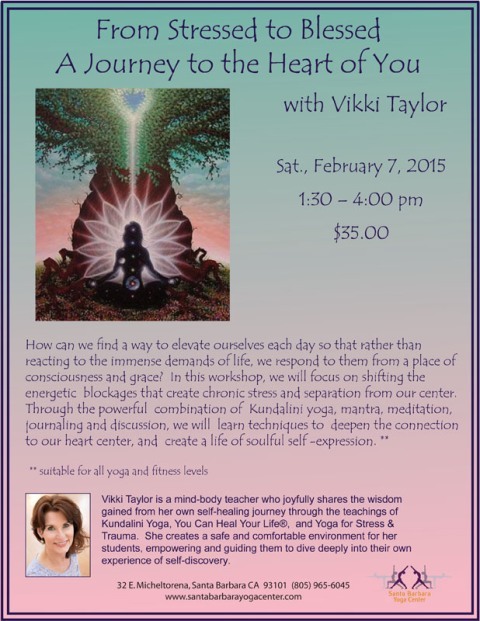 The workshop will begin with calming breath to quiet the mind and soothe the nervous system. Through the breath, we will drop out of the "thinking and doing" space into the "being" space. Moving into a gentle posture sequence**, we synchronize our breath and movement, dissolving the deeply held tension in the body. From this open and relaxed space, we flow into the Quantum Light Breath, which consists of a continuous series of artfully choreographed breath techniques, accompanied by rhythmic vibrational sound. The workshop ends with an extended deep relaxation period, allowing a full integration of this deeply intimate and personal experience into the mind, body and spirit. You will leave this workshop feeling energized and relaxed, focused and expansive, empowered and inspired - all at the same time! Recommended: For optimal experience of the QLB, it is recommended that no food be consumed less than 2 1/2 hours before the workshop, and that the meal prior to the workshop be light. Please hydrate thoroughly before arriving. **This workshop is suitable for everyone. No prior yoga or meditation experience is required. Many of us spend much of our time attending to the needs of others in both our professional and personal lives. The demands to give, share, and care both at work and at home can feel endless. We may be deeply concerned about others but often our own needs remain unmet. Burnout, exhaustion, compassion fatigue and health issues of our own arise. We have given from the well of our precious life energy rather than the overflow. This mini retreat will provide a profound opportunity for slowing down, for cultivating stillness in a quiet and nurturing space. You will be guided and supported through a gentle yet powerful blend of Restorative, Yin and Kundalini Yoga, along with meditation, mantras & breath work, all carefully chosen to soothe and recalibrate the nervous system. A simple self-massage will be taught using calming Ayurvedic oils. 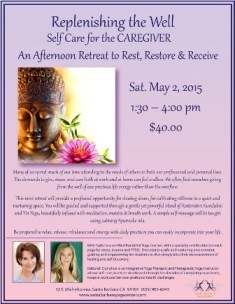 Be prepared to relax, release, rebalance and emerge with daily practices you can easily incorporate into your life. This workshop is suitable for health care professionals, therapists, teachers, hospice care providers, people caring for aging parents, parents of special needs children, people caring for the chronically ill and anyone providing care for others on a regular basis. The yoga is suitable for all fitness and yoga levels. How radically would your life change if you could free yourself from the past, eliminate repetitive negative thoughts and behavior patterns, and start healing NOW? In this course, you will identify what keeps you stuck and unable to move forward in your life. If you have tried “everything” to change, but nothing has worked, this course is for you! Based on the ground breaking book, You Can Heal Your Life, by Louise Hay, this course will teach you to love and forgive yourself and others, release negative emotions that block joy and inner peace and ignite your own personal power to create the life you want and deserve. These simple, but powerful techniques can be mastered by anyone – no matter where you are, how long you have been “stuck”, or how many other times you have tried and failed. You will learn how to control the “chatter mind” and the mental exhaustion of feeling overwhelmed, lost and powerless. As Louise Hay says, “YOU CAN DO IT”. We can learn how to elevate ourselves each day so that rather than reacting to the immense demands of life, we respond to them from a place of consciousness and grace? In this workshop we will focus on shifting the energetic blockages that create chronic stress and separation from our center. 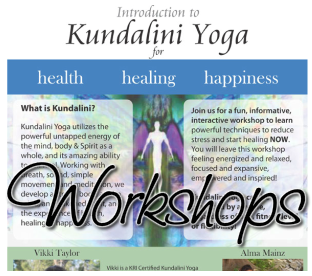 Through the powerful combination of Kundalini yoga, meditation, mantra, journaling and discussion, we will learn techniques to deepen the connection to our heart center, and create a life of soulful self-expression. This course is for women who have experienced prolonged exposure to stress or trauma, regardless of the cause. In a safe and supportive small group environment, we will practice movement, breath, mantra, meditation and deep relaxation to reclaim the body and quiet the mind. The course is an evidence-informed, clinically tested Kundalini yoga program that was developed after medical and scientific research documented that the body stores stress and trauma deeply in the muscles and the brain circuits. The effects of stored trauma may include nightmares, anxiety, panic attacks, depression, chronic fatigue, insomnia, fear, compromised immune system, and an inability to release the repetitive negative and fearful thoughts in the mind. Stored trauma can also lead to negative self defeating behavior patterns, substance abuse and addiction. The eight week curriculum provides release, relief and the tools to engage the body’s natural healing resources to reconnect with the body in a healthy way and move from a state of reactivity to an experience of safety and calm. This specialized yoga program addresses the underlying cause of PTSD and trauma, not just the symptoms, through the powerful combination of physical and mental exercises, breath work and meditations that were created to target the specific areas that have retained the trauma. As the body’s ability to self heal activates, the stored trauma is released, and a sense of security, connection and purpose return, breaking the chronic repetitive pattern of the trauma. This program is suitable for everyone, regar﻿dless of age, size, fitness level or flexibility and no prior yoga experience is necessary. Pre-registration is required prior to the first class. Space is limited, so please register early. 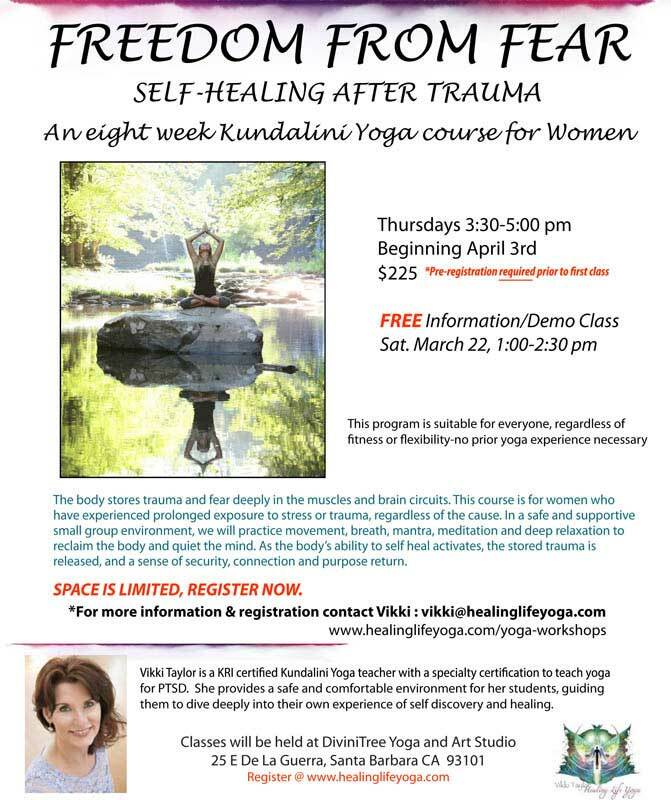 This Kundalini yoga program is for anyone who has experienced prolonged exposure to stress or trauma, regardless of the source. The nine-week curriculum addresses the effects of trauma on the brain, the physical structure of the body, and the loss of a healthy identity. In a safe and supportive environment, we will learn and experience simple techniques that allow the body to release the stored trauma, and activate the body's ability to self heal. As the body releases the trauma, a sense of security, connection, and purpose return. This program is suitable for everyone, regardless of age, size, fitness level or flexibility and no prior yoga experience is necessary. Pay Pal, cash, check, Visa or Mastercard accepted. *Pre-registration is required prior to the first class. Space is limited, so please register early. How radically would your life change if you could free yourself from the past, eliminate repetitive negative thoughts and behavior patterns, and start healing NOW? In this course, you will identify what keeps you stuck and unable to move forward in your life. If you have tried “everything” to change, but nothing has worked, this course is for you! Based on the ground breaking book, You Can Heal Your Life by Louise Hay, this course will teach you to love and forgive yourself and others, release negative emotions that block joy and inner peace and ignite your own personal power to create the life you want and deserve. These simple, but powerful techniques can be mastered by anyone – no matter where you are, how long you have been “stuck”, or how many other times you have tried and failed. You will learn how to control the “monkey mind” and the mental exhaustion of feeling overwhelmed, lost and powerless. As Louise Hay says, “YOU CAN DO IT”. 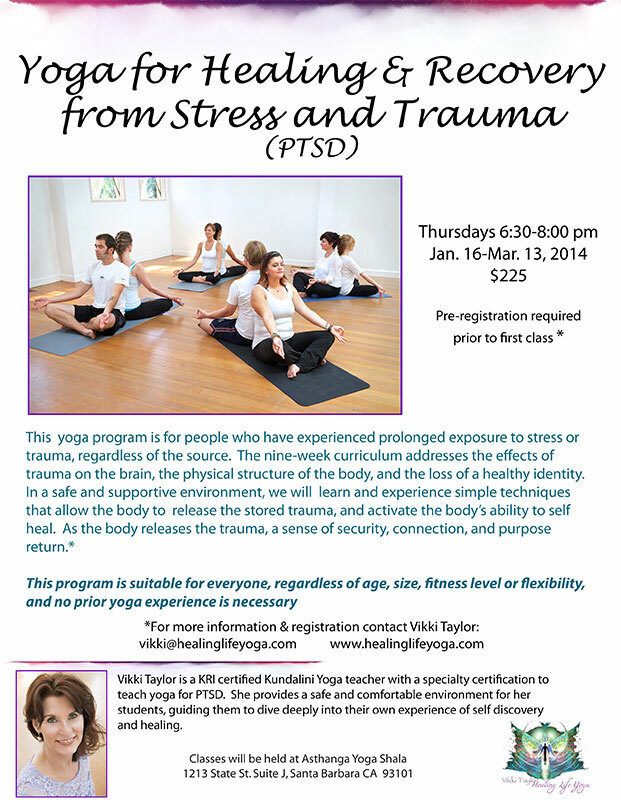 This yoga program is for anyone who has experienced prolonged exposure to stress or trauma, regardless of the source. The curriculum is based on extensive research and medical data demonstrating that trauma effects held in the physiological structures of the brain and body can be released through rhythmic breathing, gentle movements, repetitive sound and deep relaxation. In a safe and comfortable environment, you will learn simple techniques that allow the body to release the stored trauma , activate the body’s ability to self heal, and deeply reconnect to the Original Self. You will once again experience feeling grounded, calm and in control of thoughts, and experience the body as a vehicle for healing rather than pain. As the body releases the stored trauma, a sense of security, connection and purpose return. 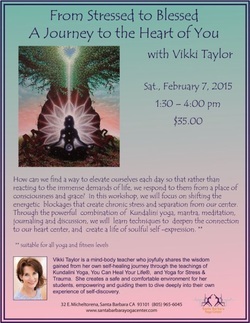 Join us for a fun, informative, interactive workshop to learn powerful techniques to reduce stress and start healing NOW. 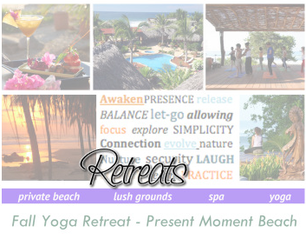 You will leave this workshop feeling energized and relaxed, focused and expansive, empowered and inspired! Kundalini Yoga utilizes the powerful untapped energy of the mind, body & Spirit as a whole, and its amazing ability to self heal. Working with breath, sound, simple movement and meditation, we develop a strong body, a calm mind, and awakened spirit, and the experience of health, healing and happiness. 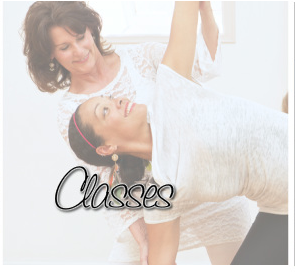 Kundalini Yoga can be practiced by anyone, regardless of age, fitness level, or flexibility! 28 E. De La Guerra St.
Kundalini Yoga is often called the Yoga of Awareness, as it teaches us how to connect with our own inner guidance and intuition. 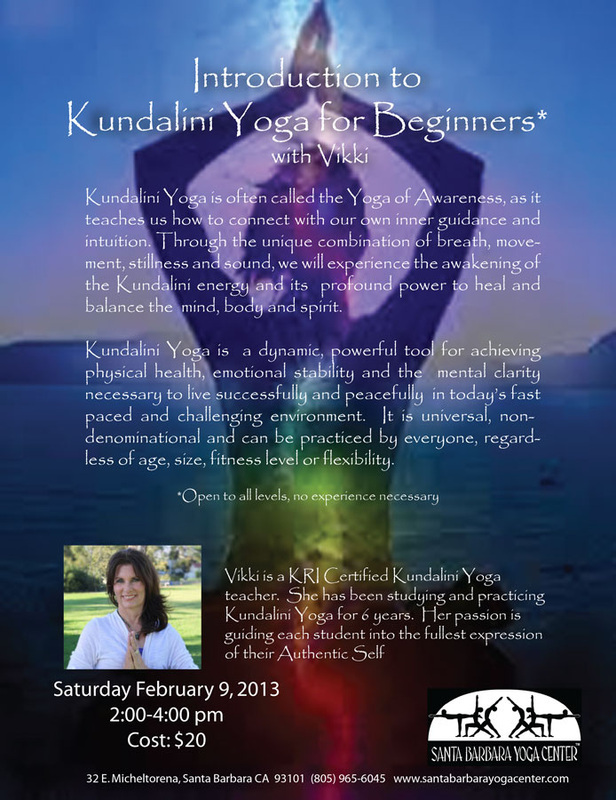 Through the unique combination of breath, movement, stillness and sound, we will experience the awakening of the Kundalini energy and its profound power to heal and balance the mind, body and spirit. Kundalini Yoga is a dynamic, powerful tool for achieving physical health, emotional stability and the mental clarity necessary to live successfully and peacefully in today’s fast paced and challenging environment. It is universal, nondenominational and can be practiced by everyone, regardless of age, size, fitness level or flexibility. *Open to all levels, no experience necessary. 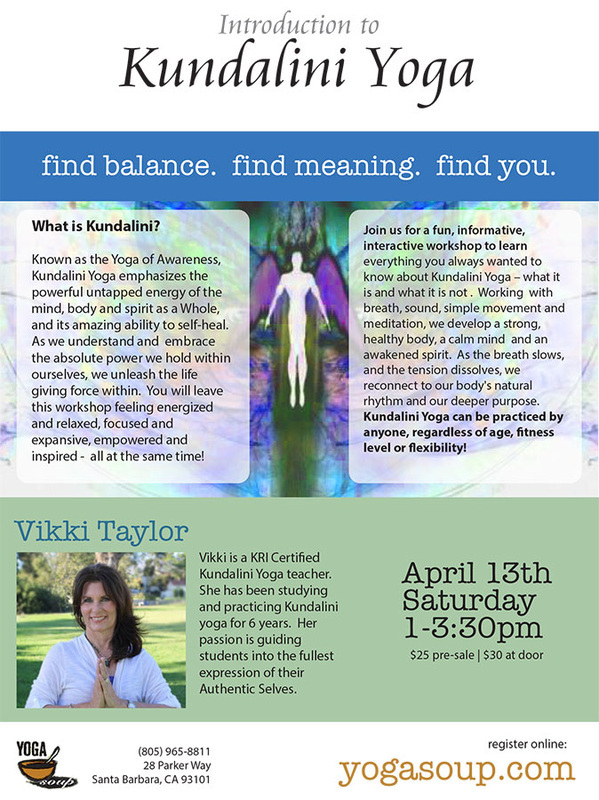 Join us for a fun, informative, interactive workshop to learn everything you always wanted to know about Kundalini Yoga – what it is and what it is not . Working with breath, sound, simple movement and meditation, we develop a strong, healthy body, a calm mind and an awakened spirit. As the breath slows, and the tension dissolves, we reconnect to our body's natural rhythm and our deeper purpose. Open to all levels, no experience necessary. How radically would your life change if you had a system to upgrade your health, well-being, outlook and expectation? Does life feel like a constant struggle with no real meaning? Are you plagued by relentless negative thoughts and mental exhaustion? Do you sometimes feel overwhelmed, lost and powerless over your life? Have you tried "everything" to change, but nothing has worked? If you answered yes to the above, this workshop if for you!